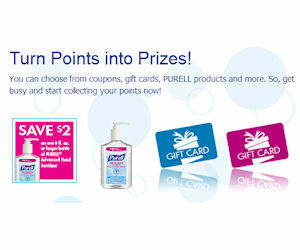 Purell Loyalty Program - Redeem Points by 12/31! Reminder: Be sure to spend your Purell Loyalty Program points by December 31st! The program will be starting fresh in the new year, so any points not redeemed will be lost. You can redeem points for free gift cards, free full-size bottles of Purell, Purell Wipes, Business Starter Kit, free trial size bottles of Purell with jelly wrap and money saving coupons!